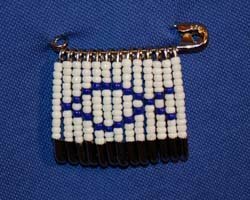 This Jesus Fish beaded safety pin is made from a few safety pins and tiny seed beads. Any color combination can be used for this pin, so you can make a pin to match any outfit. This pin will look wonderful for Easter, but also can be worn at any time of the year as a tribute to the Christian faith. This is an excellent craft for Sunday school. Older children are quite good at threading the little beads on the pins, which takes some dexterity and patience. I have found that this type of craft can keep them busy for quite awhile. It really helps them practice their eye and hand coordination as well. 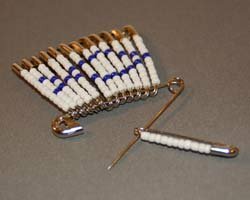 If you have never made a beaded safety pin craft before, you probably will want to check out my tips and techniques page (new window opens when link is clicked) which gives some helpful advice before beginning. 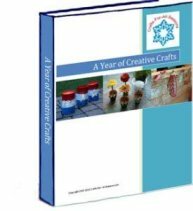 If you find you enjoy this type of craft, there are plenty other patterns I have on this site for other seasons. Here are some quick links to them: Valentine's Day, St. Patrick's Day, Fourth of July, Halloween, and Christmas. 1. 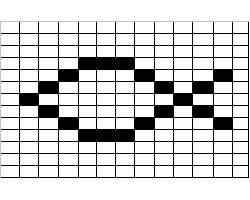 Begin your Jesus fish beaded safety pin by following the bead pattern shown on the right. (Note: if you would like to print out the pattern, click here and Adobe Reader will open up a new window for you). 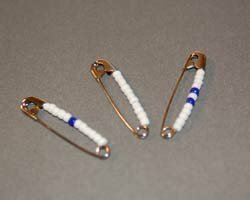 Each column on the pattern represents one of the size 2 safety pins, with white and blue beads threaded on it. Begin with the color on the top of the pattern, and thread that bead on the safety pin first. You may find some beads have an opening that is too small for the pin, but most should fit. When you are finished loading the beads, close each pin. Continue with each pin, following the pattern. Below the pattern photo is a text version of the pattern in case you cannot see the photo. Pins are going left to right; the bead order is the top bead first and moving down the pattern, the same way you would thread it on to the pin. 2. Take your large #3 safety pin, and open it. 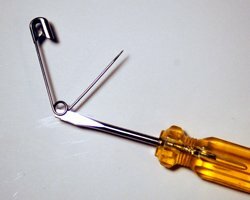 Using a flat head screwdriver, wedge the flat head in between the safety pin loop at the bottom of the pin. Once inserted, twist the screwdriver to pry the loop open a little, as shown. The goal is to be able to have enough room to allow each #2 safety pin to be threaded through this loop to the other side. 3. Thread each #2 safety pin's loop onto the big safety pin. Thread it around the large pin's loop to get it onto the other side of the pin. This way, when you wear the pin, none of the pins will slide off. You may need to experiment with the small safety pin orientation at first, but once you get the hang of it you will be putting on the safety pins in the right direction and order easily. 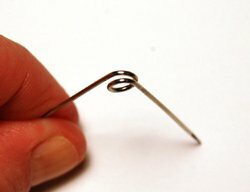 When you are all done, use some pliers to scrunch down the big safety pin's loop tight again. 4. 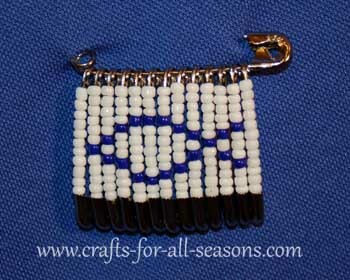 You are now ready to wear your Jesus fish beaded safety pin!